'Twinning!' 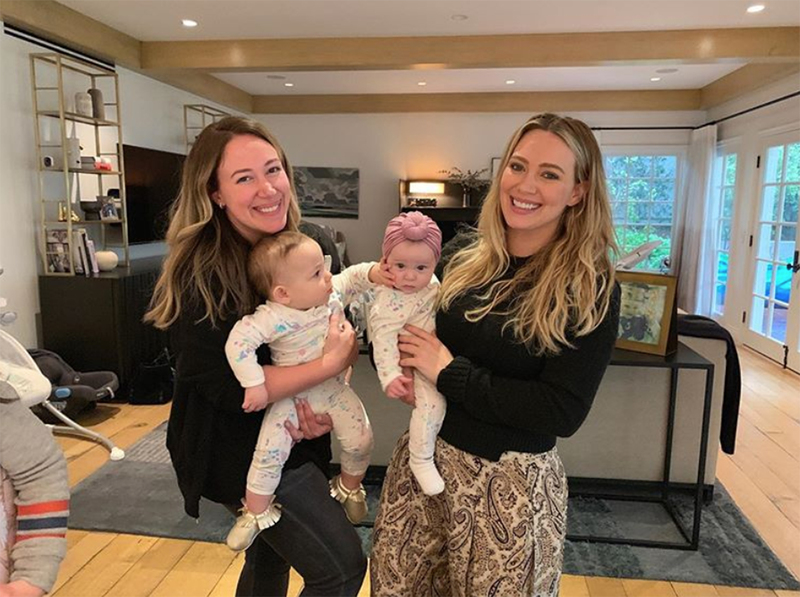 Hilary Duff and Sister Haylie's Daughters Are Too Adorable in Matching Onesies - Integration Through Media ....! Hilary Duff and her big sister Haylie Duff are bringing the cuteness. The sisters brought their families together on Wednesday to mark the birthday of Hilary’s son Luca Cruz, who turned 7 that day, posting several adorable pictures of their younger children to the delight of their combined 12 million Instagram followers. Hilary’s 4-month-old daughter Banks Violet and Haylie’s daughter Lulu Gray, 9 months, looked adorable together in a photo Hilary shared to Instagram, posing on the couch in matching splatter-paint onesies from Little Moon Society. While their baby girls wore the matching onesies, the sisters donned some coordinating pieces as well. Both Hilary and Haylie wore black knit tops. The proud mamas, who were pregnant at the same time, welcomed their daughters (for Haylie, Lulu with fiancé Matt Rosenberg in June, and for Hilary, Banks with boyfriend Matthew Koma in October) less than five months apart. However, Haylie and Hilary don’t swap parenting tips for the most part — they just focus on being there for each other. “Everyone has so much advice all the time, so we really just try to support each other whenever we feel like venting or talking something out,” Haylie explained.